This series of images speaks volumes about the effectiveness of the work being undertaken at Mulloon Creek Natural Farms, incorporating the Natural Sequence Farming work of Peter Andrews OAM and broader regenerative agriculture. Featured on the front cover of this year's Bungendore Directory is Olive the maremma from Mulloon Creek Natural Farms with some of her feathered friends, along with a tribute to Tony and Toni Coote inside. Well done to the Bungendore Chamber of Commerce & Industry on its production. At Mulloon Creek Natural Farms our eggs come from happy hens who have loads of room to roam, with only 250 birds per hectare! They can really stretch out while enjoying the sunlight and free access to pasture. Perfect! The Mulloon Institute’s Research Coordinator Luke Peel recently hosted a group of farmers from New Zealand along with farmers from Cooma (NSW) and Benalla (VIC). 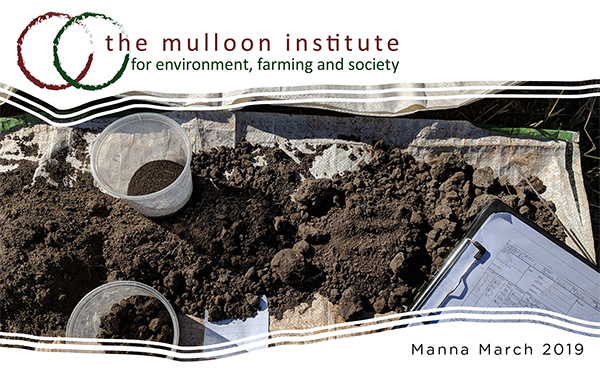 A broad range of projects are available for Honours, Masters and PhD students to undertake post graduate studies in flora, fauna, hydro and soils and production systems as part of the Mulloon Community Landscape Rehydration Project. We were excited to have a group of innovative Victorian farmers join us for a creek walk today at Mulloon Creek Natural Farms to learn about the regenerative practices being implemented here. Thanks for visiting East Gippsland Landcare Network and Far East Victoria Landcare! The Mulloon Institute hosted part of the National Youth Science Forum again this January, with two groups of 14 students interested in Agriculture and Environmental Science visiting Mulloon Creek to learn about our work in landscape rehydration and regenerative farming practices. Our offices will close from Friday 21 December 2018 (COB). Have a safe Christmas Holiday period, from all of us at The Mulloon Institute. Mulloon Creek Natural Farms are located 40 minutes east of Canberra and 3 hours from Sydney. Founded by Tony Coote AM on the farm he owned for over 50 years, MCNF is operated on the principles of holistic, biodynamic farming and is 100% certified organic. Our Annual General Meeting was held in North Sydney this year and was very well attended and for the first time we also chose to live-stream the event.